In an equatorial volcanic plateau in Mars’ western hemisphere lies a trio of volcanoes collectively known as Tharsis Montes. The southernmost member of this group of shield volcanoes is called Arsia Mons (the other two being Ascraeus Mons and Pavonis Mons). Ever since they were discovered by the Mariner 9 spacecraft in 1971, astronomers have been trying to determine when these volcanoes were last active. Now, using high-resolution images of the Arsia Mons, captured by the Context Camera on NASA’s Mars Reconnaissance Orbiter, a team of scientists has discovered when this volcano last produced lava. According to the researchers, volcanic activity in Arsia Mons last took place 50 million years ago — roughly around the time the last dinosaurs went extinct on Earth. For the purpose of their study, the researchers mapped the boundaries of the lava flows from each Arsia Mons’ 29 volcanic vents and then added up the number of craters at least 330 feet in diameter, which helped them estimate the ages of the flows. When this information was analyzed using a computer model, it was found that the oldest lava flow in the volcano dated back about 200 million years, while the most recent ones occurred between 10 and 90 million years ago. 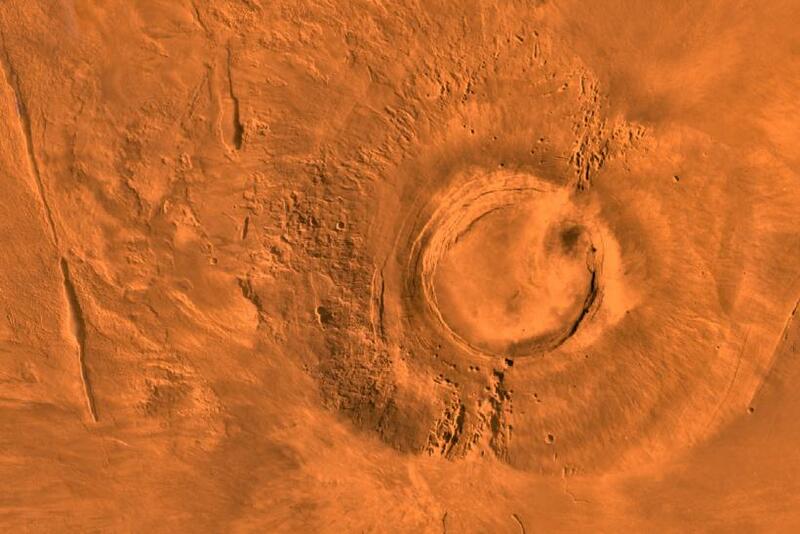 At its peak, Arsia Mons may have produced roughly 1 to 8 cubic km of magma every million years. Scientists believe that mapping Mars’ volcanic activity is key to understanding the planet's inner structure and the geological history. This, in turn, would help shed light on how all rocky planets, including Earth, form and evolve.